Barney. With his chalk board of Girls that could possibly be trying to sabotage him!. 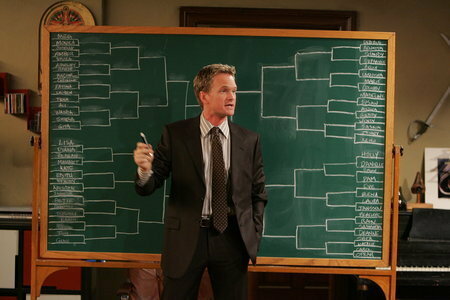 Wallpaper and background images in the How I Met Your Mother club tagged: how i met your mother himym image picture barney stinson the bracket chalk board final sixty four. This How I Met Your Mother photo contains business suit. There might also be well dressed person, suit, pants suit, pantsuit, suit, and suit of clothes.